Washington (AP) – From the cacophony of day care to the buzz of TV and electronic toys, noise is more distracting to a child’s brain than an adult’s, and new research shows it can hinder how youngsters learn. In fact, one of the worst offenders when a child’s trying to listen is other voices babbling in the background, researchers said Saturday at a meeting of the American Association for the Advancement of Science. “What a child hears in a noisy environment is not what an adult hears,” said Dr. Lori Leibold of Boys Town National Research Hospital in Omaha, Nebraska. Consider how hard it is to carry on a conversation in a noisy restaurant. 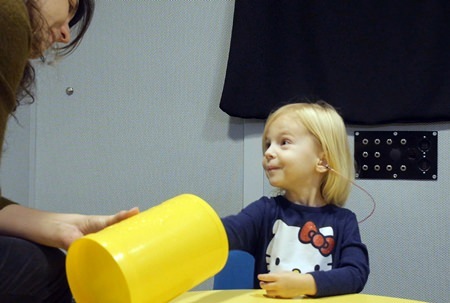 Researchers simulated that background in a series of experiments by playing recordings of people reading and talking while testing how easily children detected words they knew, such as “playground,” when a new voice broke through the hubbub, or how easily they learned new words. Nor is the challenge just to tune out the background buzz. Brief sudden noises – someone coughs, a car horn blares – can drown out part of a word or sentence. An adult’s experienced brain automatically substitutes a logical choice, often well enough that the person doesn’t notice, Newman said. “Young children don’t do this. Their brain doesn’t fill in the gaps,” she said. Children who were born prematurely may have an additional risk. When preemies spend a long time in an incubator, their brains get used to the constant “white noise” of the machine’s fan – different from a full-term baby who develops hearing mom’s voice in the womb and thus is wired to pay more attention to voices, said Dr. Amir Lahav of Harvard Medical School. “Exposure to noises and sounds very early in life will spill over to affect how our brain is going to function,” Lahav said. – Don’t leave the TV, radio and other electronics on in the background. It’s not clear whether soft music is distracting, but lyrics might be, Ratner said. – Speak clearly and make eye contact. – Especially in noise, make sure tots see your face. They can pick up on mouth movements, Newman said. – If the child doesn’t understand, try again with simpler words. – If a child’s having school behavior problems, make sure being unable to hear in class isn’t the problem. Next articleIs it a case of crying wolf?